How bold are you when it comes to trying something different with your venison, whether it be a new recipe or different part of the deer, elk or moose you've never tried? Some folks are bold as can be. Others, not so much. If everyone was the same then life wouldn't be as fun, eh? Ask someone to try a piece of heart and you'll find out quickly which camp they're in by their reaction. Venison heart - from a deer, moose, pronghorn, elk - or any heart, for that matter, such as grilled waterfowl hearts, aren't traditional and commonly known parts of the animal in the United States. Although many hunters and their families have eaten deer heart, and liver, for decades, many never have tried it. The heart is quite edible, though, and if prepared correctly can be delicious. A whitetail or mule deer heart probably could feed one or two people, while a moose or elk heart will be big enough for four or five. A few years ago in Wyoming at a processor I saw a bison heart removed during the processing and it was gigantic. Looked gorgeous, too. Here are six venison heart recipes to try. If you want to practice before big game and waterfowl seasons arrive, ask your local grocer or specialty shop if they can order beef, lamb, chicken or turkey hearts. The latter two already are bite-sized, can be cleaned well and then put on skewers for a few minutes on the grill. Brush with a marinade, or just sprinkle with salt and pepper, and enjoy. Be bold. It's good for you. Hank Shaw is an James Beard Award winner and former political writer who decided the outdoors world looked more fun. It is. He's a heck of a forager, chef and has some great recipes on his site, including this one for Grilled Deer Hearts. Shaw explains that the marinade he suggests more easily penetrates the thinner heart muscle, unlike thicker ones from other parts of the deer, and therefore gives your meal more flavor. This recipe from Keith Sutton is a GrandViewOutdoors.com favorite. Sutton makes a great point — don't overcook the meat. Even just an extra minute or more can result in tough, chewy and nasty meat. Stay on top of things and don't overcook it. In a large skillet, heat the butter, teriyaki sauce and oil over medium heat. Add diced onions and cook until tender. Place slices of heart in the pan and cook 2 minutes on each side. (Don’t overcook.) Salt and pepper to taste. Serve with your favorite sides and enjoy! Steven Rinella, known for his popular television-web show MeatEater, also is an accomplished author and speaker. He grew up like many of us, enjoying the outdoors, and as his show's title says he also loves to eat wild game. This recipe for Stuffed Wild Game Heart is among several venison heart recipes on his site and sounds great. I've never been a big fan of stuffing inside a turkey, but with the ability for heat in the oven to easily cook to the center of this stuffing, thus ensuring it's all done, this will be on my to-try list. As his recipe says, it can be made with any cloven animal. So if you have a big bison, moose or elk heart, this could be one to add to your list. Andrew Zimmern is an award-winning chef, author and television host, has traveled around the world, and has tried many things. This recipe for Beef Heart Anticucho is from Peru, where preparing and eating meat has been refined for centuries. Zimmern's show Bizarre Foods highlights some exotic fare, with heart grabbing the spotlight in many shows. This recipe will take a little more time than some of the others but should yield a super dish your family will enjoy. Try it with beef, and then with venison during hunting season. 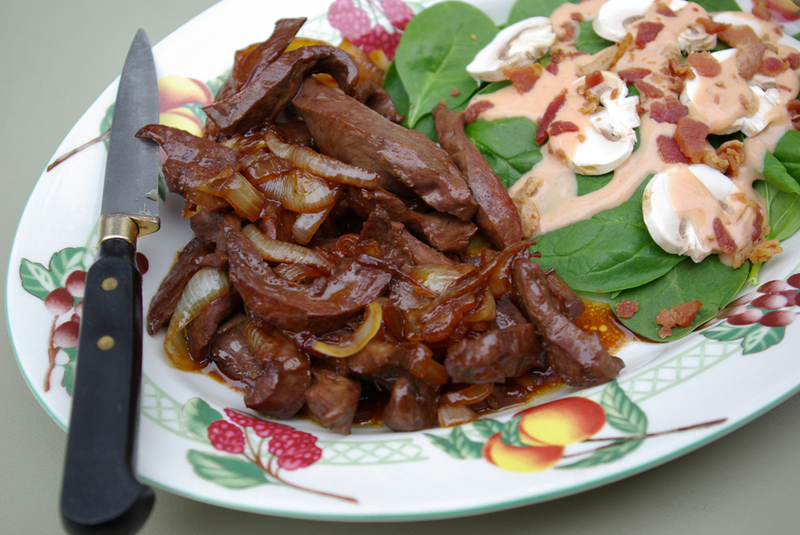 Grand View Editor Hilary Dyer whipped this venison heart recipe up while on a hunt and it was a big hit in camp. Even better, it's so simple that anyone can do it. This is one you can practice with beef hearts and be ready when the season arrives to dazzle your family or hunting buddies. Trim the “heartstrings” from inside the heart, and cut the heart into strips. Bread the strips in flour and fry it fast. Consume. Scott Rea lives across the pond in England, where his videos about hunting, preparing and cooking wild game along with domestic meats are incredibly popular. Rea gives super, easy-to-understand instructions about how he breaks down animals, why, and the preparation to make each dish. Plus, he's funny and a hoot to watch. This video is how to stuff and cook lamb hearts. Why are we including this? Because you can get another idea of what to do with your wild game hearts. Enjoy.